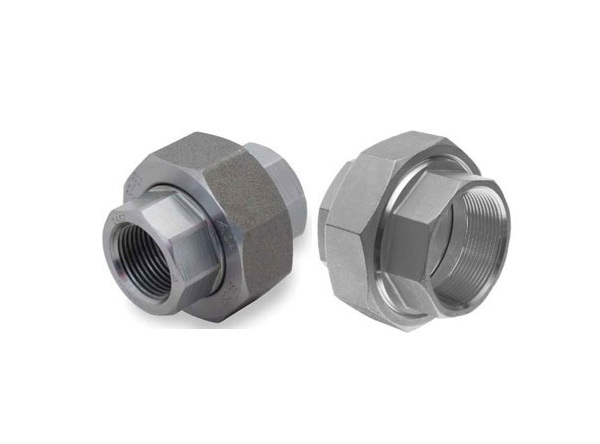 Stainless Steel ASTM A182 F304/304H Forged Union, ASTM A182 SS F316/316L Forged fittings Union, ANSI/ASME B16.11 ASTM A182 SS F317L Forged Fittings Union, ASTM A182 SS 321/347 Forged Fittings Union, Duplex Steel ASTM/ASME A182 F44/F45 Forged Fittings union, ASTM A182 F51/F53/F55 forged Fittings Union, Carbon Steel ASTM A105 Forged FIttings Union, Alloy steel ASTM A182 F1/F5/F9 Forged FIttings Union, ASME A182 F11/F22/F91 Forged Fittings union, Monel ASTM A564 400 Forged FIttings Union. JF Engineering Products LLP is Manufacturer, Stockists & Supplier of premium quality range of ASME B16.11 Forged Union that are manufactured under the expert guidance of our diligent workforce. we are highly experienced company in ASME B16.11 Forged Union. our ASME B16.11 Forged Union are manufactured using quality material and go through a rigorous quality check at all stages of production to ensure quality. Orders will be sent out within 2-3 business days, and may take up to 5-10 business days in transit. If ASME B16.11 Forged Union is out of stock, orders may take up to 2-4 weeks to ship. JF Engineering Products LLP will notify buyer if this situation occurs..